Parents, I've really done it this time. I've created the perfect recipe to incorporate an incredible amount of nutrition and fiber into your kids diets without them even knowing! It occurred to me when I was juicing this morning that I was throwing away a lot of nutrients in the pulp. That just didn't seem acceptable to me. I've used the pulp from green vegetable juices, carrots, tomatoes, and beets to stir into stews, soups, and sauces in the past and they taste great! But today I had just juiced green apples, blueberries, strawberries, watermelon, ginger, kiwi, and spinach. I thought to myself that I couldn't possibly use this for soup or stew! It’s even a strange combo for muffins or bread! And then it hit me. 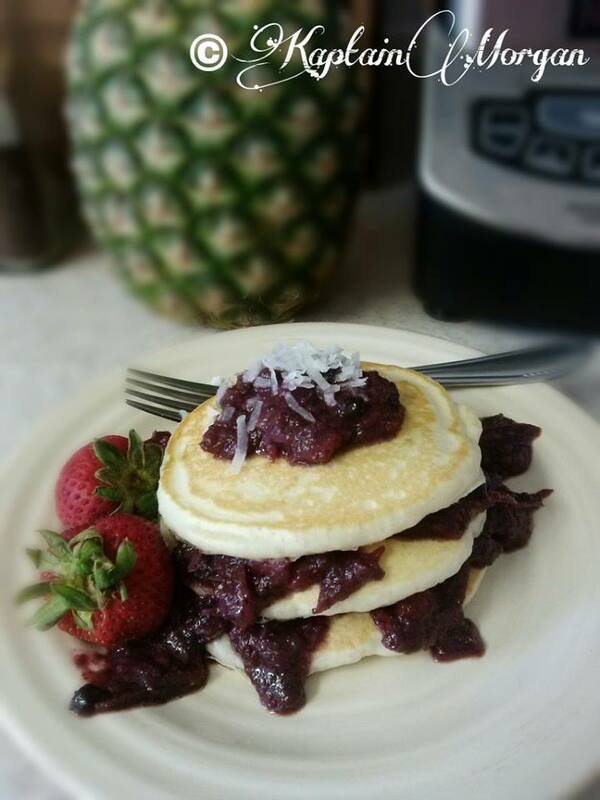 I decided to make a healthy and delicious fruit reduction sauce for kids to top their healthy pancakes with! They would never know there was spinach in it, because the berries out-flavor it. I quickly scooped the fruit pulp out of my juicer, and came up with this delicious and healthy recipe. I hope you and your children enjoy it as much as I did! You can make this recipe in several varieties. Use any combo of fruits and veggies that you would like to incorporate into your child’s diet. Fruit and vegetable pulp is a wonderful source of vitamins, minerals, and fiber. If you also juice, now you have a recipe to utilize the wonderful pulp for! You can also freeze your pulp, and thaw it out for 30 minutes before you are ready to use it. 1) Make your breakfast juice in a juicer or blender. If using a blender or blender-type device (such as a Ninja or other device) then you will need cheesecloth or a nut-seed bag to strain the pulp. After juicing in a juice machine, set pulp aside. You can freeze the pulp for later use. If using a blender type device, strain your juice from the pulp inside of a nut-seed bag or by draping a large piece of cheesecloth over a mason jar, pouring juice over cheesecloth slowly, and squeezing out the cheesecloth carefully. Set pulp aside. Repeat until all of your pulp has been removed from the juice. 2) In a small skillet, melt coconut oil over medium heat. Add ½ of fresh or frozen organic blueberries, and the diced strawberries. Stir until incorporated with coconut oil. 3) Stir in raw shredded coconut. Mix well, continuing to sauté over medium heat. Add 1/8 cup filtered water to the pan and bring back to a slow boil. As soon as mixture starts to bubble again, add your fruit and spinach pulp. Stir until incorporated. Sauce will be noticeably thicker. 4) Lower heat and let the fruit sauce reduce. Stir occasionally. When sauce becomes thick and sticks to the backside of a spoon, you can either serve it over healthy pancakes at that point, or you can allow it to cool down and puree it. If you like it chunky like I do, then just serve it fresh out of the pan. Pureeing will give your “secret” fruit sauce more of a runny texture like syrup. If it becomes too thick, you can always add a couple of tablespoons of your actual morning juice, or water. 5) You could serve this over whole grain toast or English muffins. The possibilities are endless! Get creative with this recipe, and share it with your friends! You’re kids won’t know that there are healthy ingredients in their yummy “secret syrup,” and you can feel better about knowing what is going into their food. Enjoy!